I'm sure that this won't last long and so I might as well put it onto the blog for posterity. 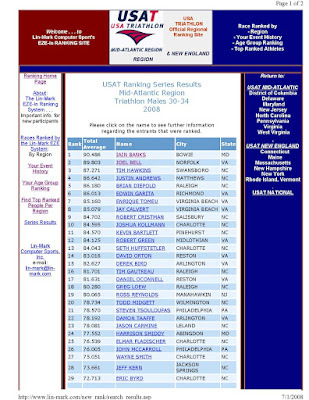 The triathlon rankings for the Mid-Atlantic region as of July 1st, 2008 have been posted and guess who is number 1 in the 30-34 Age Group (and 6th overall).....yep me! So here you go, just to prove that it is true!